I saw the color for this bike on an a 64 Ford Falcon. I immediately fell in love! Every build starts with a multitude of features and focal points. Sometimes you can build an entire machine around just one special feature. This bike really started to take shape after arranging the color scheme, front drum brake, and Italian slip on muffler. During the design process you find yourself wanting to implement these special features so as to create the machine around them. As with all Kott builds the motor was immediately disassembled for an overhaul. The next phase of the build included the fabrication of new fuel tank mounts for the 750SS tank. The seat was then constructed to neatly tuck the downsized battery and redesigned wiring and charging system underneath it. The pipe offered some challenges when trying to establish an aggressive angularity. The custom rearsets were repositioned to allow for the new muffler angle. In using the original stock headlight bucket we were able to tuck the headlight assembly tightly into place. And with the use of our custom altered headlight brackets, any unwanted vacancy in design was avoided. 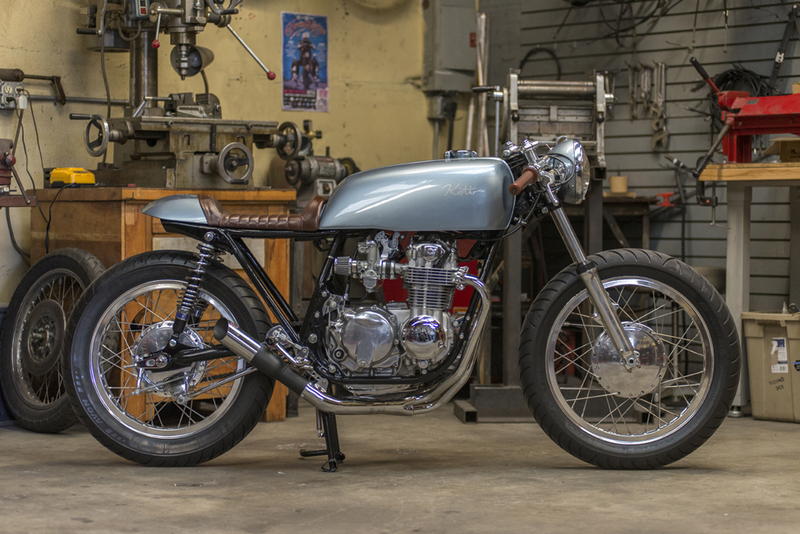 The front drum brake was from a CB 350 model and really brought a simplicity to the machine. With the use of a fork brace, any deviation in handling was addressed. The final touch was the classic mid sixties silver/ blue paint scheme against a red/brown leather upholstery for the seat. I really love the overall look and feel of this machine that became known as Falcon blue.